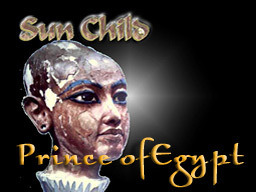 Starwalker Productions Release Sun Child, Prince of Egypt, the novel! Now Playing: Order First Edition copy now! Go to my eStore to get your order in now! Don't miss out! The brilliantly edited and laid out for easy reading real book. Find out how the little Prince of Egypt became King Tutankhamen! or directly from my printers at my eStore. Now Playing: Debut Novel arriving! 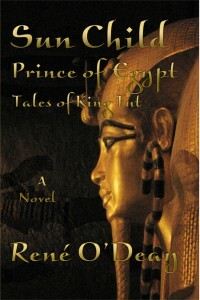 Sun Child, Prince of Egypt: How Tut became King! is scheduled for the Fourth of July Weekend. A copecetic arrangement of fate, as the rebel author O'Deay has refused to offer her novel to any agents or publishers who will only offer a paltry 10 or 15 percent royalty. Or wait the length of time to get it to press, and publication. So fearlessly braves the Internet to publish online. The book will soon be available on a CD in various forms. PDF, HTML, and perhaps audio. Just got my new website. Now I'm 'professional'! Working on major rewrites in SUN CHILD, PRINCE OF EGYPT. I was looking for a way to bring my series to the attention of Oprah, as her endorsement could put the whole thing over the top. when lo and behold, Funds4Writers newsletter, Hope Clark said just fill out the application and OGetTheMoney! Well, I worked on the submission for two weeks, it's really a business plan for the series franchise, with the encouragement of my son Shan, and some from my Dad, who is laid up with a broken leg. And today I submitted it! Things have really changed since I tried to start this blog. So far it's just for me. Well, we will see.Like my spiritaul teacher said, make the effort, and leave the results to God. Hi, Never did this before and of course there is a first time for everything. Have sent off the first two queries...testing the waters.